The Star One C4 satellite is unloaded from an Antonov AN-124 cargo aircraft at Cayenne’s Félix Eboué International Airport after arriving in French Guiana. 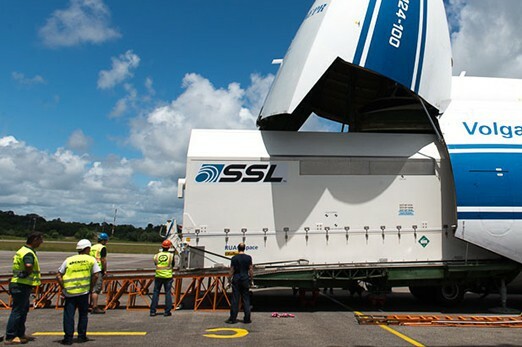 A payload’s arrival in French Guiana for an upcoming Spaceport launch always is a notable event, and the recent delivery of the Star One C4 satellite for Ariane 5’s flight this July has great significance – as it will mark SSL’s (Space Systems Loral) 50th mission with Arianespace. Star One C4 was designed and built by SSL for Embratel Star One, based on the SSL 1300 platform that provides high power and the flexibility to support a broad range of applications and technological advances. After its launch by Ariane 5 on Arianespace Flight VA224, the spacecraft will be positioned at 70 deg. West longitude for a service lifetime of 15 years or more. This is to place Star One C4 in a “hot spot” location for the relay of signals from major TV stations in Brazil, with 22-25 million parabolic antennas pointed in its direction. Star One C4 features 48 Ku-band transponders and is to reinforce Embratel Star One’s direct-to-home services in Brazil, while expanding access to other Latin American countries and to the mainland United States. 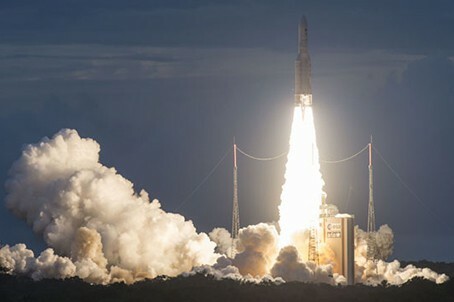 July’s Ariane 5 mission will mark another dual-payload flight for Arianespace’s heavy-lift workhorse, with Star One C4 being joined by the European MSG-4 meteorological satellite.